For the past decade I have been walking the sidewalks of my hometown, Somerville, MA, usually alongside my husband Reebee, but always with a camera in my pocket. We walk partly because we enjoy the exercise, but also because we know that as we amble through the city’s densely built neighborhoods, something quirky or noteworthy is likely to catch our attention in the yards, porches and driveways of the houses we pass by, calling out for a quick photograph. 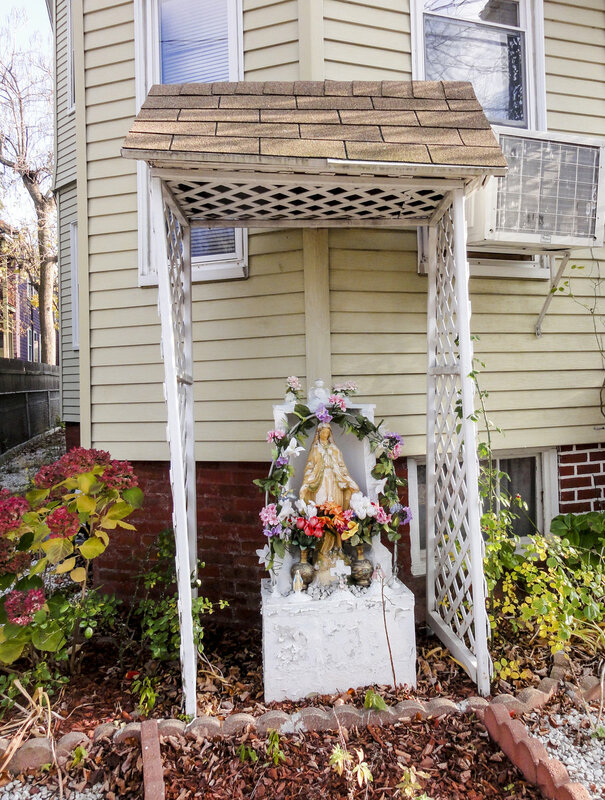 Among the objects visible in these outdoor domestic spaces, none are more rich with self-expressive creativity than the front yard shrines and statuary that historically have been one of the signature characteristics of Somerville’s streetscapes. “Bathtub Mary" shrines have been attributed (although I'm not sure how reliably) to the Portuguese-Azorean immigrants who settled in Massachusetts’ coastal cities of New Bedford and Fall River, about an hour south of Somerville, but by now they can be found throughout the country. So, yes, you can find Catholic statuary in the yards of other communities like Somerville, where Catholic immigrants of Italian, Portuguese and Irish origin and their descendants have resided for decades. But it is unlikely that you will find so many in such a small concentrated area, and in such variety of forms, than in Somerville. For a casual street photographer like myself, stumbling upon these visually intriguing expressions of popular religiosity has provided me with endless pleasures. Later on, when I review the images that I captured on the fly on the big screen of my computer, curious details I hadn’t noticed at first often reveal themselves, doubling the joy of discovery. The spaces surrounding the houses in which these statues are placed are a fascinating blend of private and public domains: private because owners arrange and use the space within their property lines according to their own inclinations; but also public, because, unlike the interiors of the homes themselves, the yards and their contents are fully visible to passers-by. Intentionally or unintentionally, these spaces allow anyone taking the time to look beyond their ordinariness to catch glimpses into the lives, cultures and personalities of the residents. Indeed, these statues, and the ways they are decorated and located within their immediate surroundings, are part of what give Somerville its unique, local personality and flavor. After years of randomly taking photos of the shrines I encountered while walking around Somerville, I eventually found myself overwhelmed by an unmanageable quantity of photographs accumulating on my computer's hard drive. But as I began re-viewing the photos when I switched over to a new photo management system, what I’d once thought of as an excess of images revealed itself to be a treasure trove: the sheer numbers of images allowed me to see patterns and themes I couldn’t have imagined when I took the individual photographs. It is my hope that this photo essay, organized by themes, or as I'm calling them, lenses, will provide viewers with a similar sense of discovery by seeing our city’s front yards, porches and driveways —so familiar and mundane we usually walk by without paying much attention—in fresh new ways. I am certainly not the first (nor the last) to be drawn to the statuary in Somerville front yards. Somerville librarian Cathy Piantigini, for example, has systematically walked every street in Somerville to photograph and map every Bathtub Virgin she could find, and she created a wonderful blog, “Bathtub Marys of Somerville” that contains over 350 images and their street addresses. Thanks to Piantagini’s comprehensive work, Somerville’s wealth of bathtub Mary’s are mentioned in a Wikipedia entry on Bathtub Madonnas. Somerville photographer Gary Duehr, in contrast, has responded to them aesthetically, and his playful images of virgins have been displayed in Somerville's Nave Gallery Annex; he has also printed some of his images onto a variety of objects, such as coasters and calendars, for broader dissemination. My own way of responding to these front yard altars is partly a result of my interest in street photography, and partly a reflection of my profession as a cultural anthropologist, whose goals have been (pardon my academ-ese) to make legible the multiple, but contextually logical ways that people in diverse locations throughout the Americas construct, make sense of and interpret their environments. Yet if anthropological fieldwork requires me to interact with people, asking questions about why they do what they do, my street photography is a much more solitary process: without engaging anyone, I let the richness and vitality of these front yard shrines speak for themselves; my only intervention is choosing how to frame the image. In case you are wondering: despite my Italian surname, I’m not Catholic, so I do not have a very deep understanding of the Catholic symbolism inspiring those who build and maintain these shrines. Instead, I respond to the creative, whimsical and often bizarre character of Somerville’s front yard statuary with humor, but my tongue in cheek descriptions of Somerville’s front yard statuary does not imply disrespect for the religious and aesthetic inclinations that inspired their placement and decoration. On the contrary, I want my photos to honor Somerville homeowners’ yard shrines as expressions of popular religiosity and folk art.